Although there are three major types of power presses — mechanical, hydraulic, and pneumatic — the machinery that accounts for a large number of workplace amputations are mechanical power presses. In mechanical power presses, tools or dies are mounted on a slide, or ram, which operates in a controlled, reciprocating motion toward and away from the stationary bed or anvil containing the lower die. When the upper and lower dies press together on the workpiece, a re-formed piece is produced. Once the downstroke is completed, the re-formed workpiece is removed either automatically or manually, a new workpiece is fed into the die, and the process is repeated. Amputations occurring from point of operation hazards are the most common types of injuries associated with mechanical power presses. 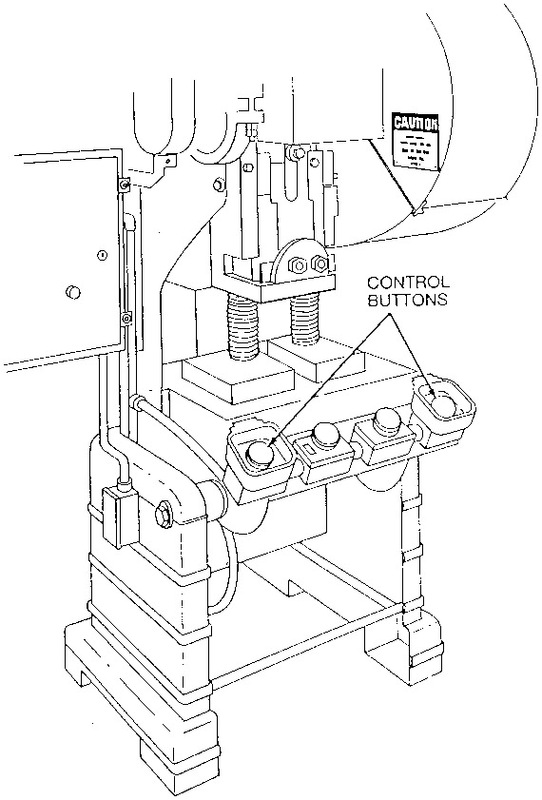 Inadequate safeguarding allows the operators to inadvertently activate the power press tripping mechanism while their fingers are in the die (point of operation). For example, amputations can occur when an operator instinctively reaches into the point of operation to adjust a misaligned part or release a jam. § Guards and devices disabled to increase production, to allow the insertion of small piece work, or to allow better viewing of the operation. § Two-hand trips/controls bridged or tied down to allow initiation of the press cycle using only one hand. § Devices such as pullbacks or restraints improperly adjusted to fit the specific operator. § Controls of a single-operator press bypassed by having a coworker activate the controls while the operator positions or aligns parts in the die, or repairs or troubleshoots the press. § Failure to properly lockout/tagout presses or to have a special method in place for making adjustments, clearing jams, performing maintenance, installing or aligning dies, or cleaning the machine. 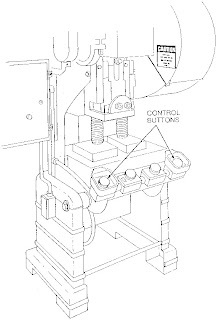 Some amputations are linked to machine failure, such as failure of a single-stroke linkage resulting in a “double cycle,” electronic failure of two-hand controls, brake failure resulting in the slide falling, and jammed relays in light curtains. Mechanical power presses are extremely versatile, and selecting appropriate safeguarding methods depends on the specific press design and use. You should consider the press, the type of clutch used, the stock size, the length of production runs, and the method of feeding. You can use engineering controls such as guards to prevent injuries. For example, §1910.217 requires employers to provide and ensure the use of point of operation guards or properly installed devices on every operation performed on a press when the die opening is greater than 1/4 inch. If the dies of a power press can be adjusted so that they never open more than 1/4 inch, there is no need for a point of operation guard. This is referred to as “stroke limitation” and is a good choice when practical. In addition, guards must conform to the maximum permissible openings of Table O-10 of §1910.217. Guards must prevent entry of hands or fingers into the point of operation through, over, under, or around the guard. While using an unguarded, foot pedal-operated, full-revolution mechanical power press that made trip collars for wood stoves, an employee used his hands to feed and remove finished parts and scrap metal. He placed the completed part to the left side of the press, then turned to place the scrap in the bin behind him. As he turned back to face the press, he inadvertently stepped on the foot pedal and activated the press while his hand was in the die area. His left hand was amputated at the wrist. Removing scrap or stuck work with tools is required even when hand feeding is allowed according to §1910.217(d)(1)(ii). You must furnish and enforce the use of hand tools for freeing or removing work or scrap pieces from the die to reduce the amount of time an operator’s hand is near the point of operation. In addition, work practices such as regular mechanical power press inspection, maintenance, recordkeeping, and reporting are essential. § §1910.217(e)(1)(i) requires a program of periodic and regular inspections of mechanical power presses. You must inspect and test the condition of the clutch/brake mechanism, antirepeat feature, and single-stroke mechanism and maintain records of these inspections and the maintenance performed. § §1910.217(g), requires the reporting of all point of operation injuries within 30 days to OSHA. 6. 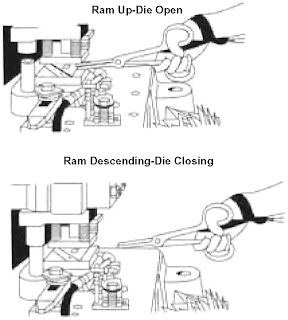 Enclose the point of operation before a press stroke can be started to prevent the operator from reaching into the danger area before die closure or enclose the point of operation prior to cessation of the slide motion during the downward stroke. § Control point of operation hazards created when guards are removed for set-up and repair by operating the machine in the inch mode. 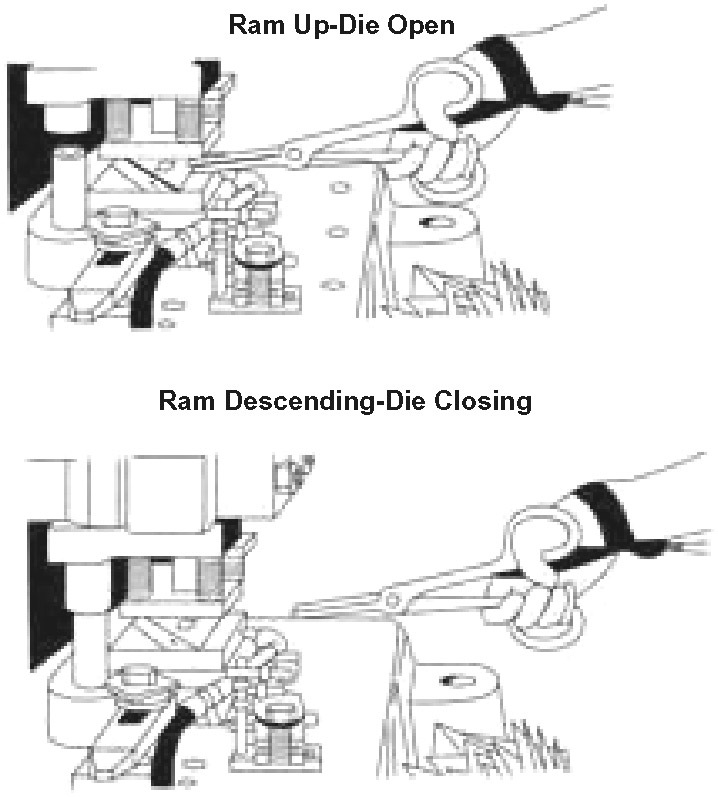 This involves using two-hand controls to gradually inch the press through a stroke when the dies are being tested on part-revolution clutch presses. § Avoid making machine repairs or modifications while the machine can be stroked. § Prevent stroking by using die blocks or interlocked barrier guards. § Disconnect or remove foot controls while die work is being performed if they are used to initiate the stroke. Training is essential for worker protection. As an employer, you should train operators in safe mechanical press operation procedures and techniques before they begin work on the press. Additionally, supervise operators to ensure that correct procedures and techniques are being followed.